I am satisfied with this card. I have a low monthly payment. Credit limit increases are available with good outstanding payment history. Only thing is the increases are $50. Well better than nothing. Great card to rebuild ypur credit with!! Thank you so much for the opportunity to improve my credit rating by accepting me as a credit card holder. Hi, I have poor credit of about 550. I didn’t think I would be approved when I filled out the simple app. To my surprise I was excepted. Yes their high on their rates but their taking a chance on me. I intend to use this card with respect. Thanks Oneda. I is good to simply try to get help for your credit and build it up at the same time .. To be able to.have a back.up plan in case of a emergency arose and you had to something in a certain time. I haven’t been able to get a credit card in 10 years! 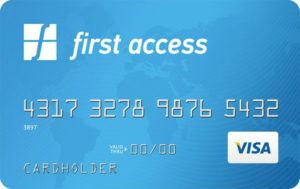 Thank you First Access for the opportunity. Great card for building credit!!!! I was looking for a simple way to start building my credit. The card does the job. I’ve keeping tabs of my credit score. The key is to make all your payments on time, EVERY TIME. Hope this helps!!!! !